On Sunday April 6 seven of us met up in Union Square to map the proposed MBTA development sites for the Green Line extension. Construction has already started in Medford with development on the Union Square spur scheduled to start in September 2014. 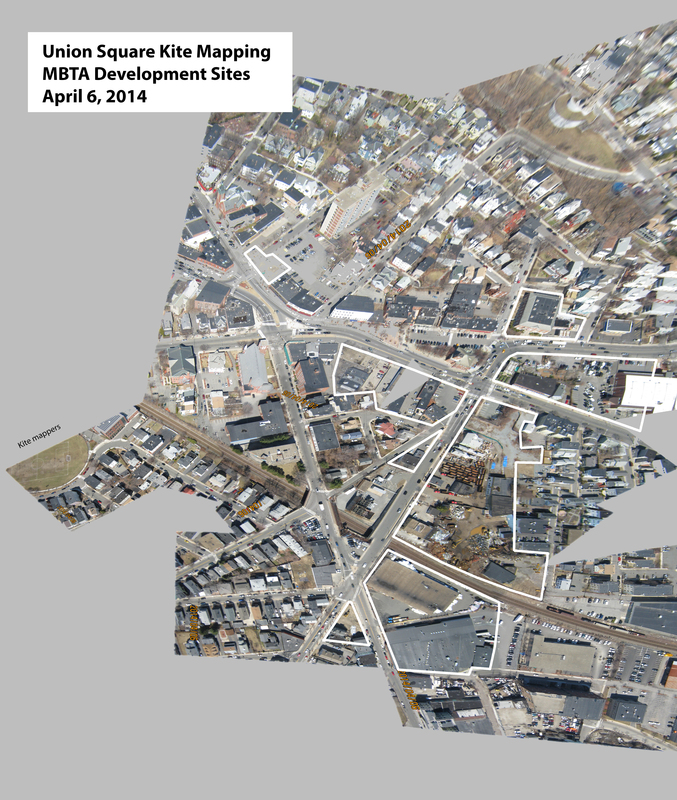 This map shows the seven possible development lots, as well as the future site for the MBTA station, schedule to open in September 2017. Wind conditions were nearly perfect with a steady NE breeze. We were initially planning to launch in the center of Union Square but moved just west of the square to Argenziano field (many thanks to the Somerville rec guy who let us hop the fence!) I'd initially be hoping to try out the redstone rig but we ran out of time for printing. We took over 1500 photos -- see flickr for a sample set. This is a rough version of the map we stitched together showing our flight location and the seven proposed development lots (outlined in white). My plan is to return in September to photograph construction of the MBTA station on Prospect Ave once they break ground and to continue to document the area over the course of the project's development. It would be great to combine this with efforts to map other parts of Somerville, specifically along the Medford line where construction has already started. A-1 New & Used Plumbing & Heating, which sells antique radiators, tubs and other vintage fixtures. Empire Marble & Granite, which installs kitchen countertops. Prospect Iron & Steel, a scrap metal recycling business. Allen Street Auto, a junkyard. The goal of the mapping was to document what the sites looked like prior to construction starting and to raise awareness about which sites the city has proposed purchasing, which stretches all the way across the square including Ricky's Flower Market and the bank next to Reliable Mart. In the course of scouting locations I also talked to a number of local business owners, many of whom are on prime lots that are being threatened with eminent domain or development and are concerned with the long-time viability of their businesses in the face of encroaching development. Wow, the rough stitched map looks great! It's not rough at all... can you post the link to the MapKnitter page? It displays the images you used for download at full res, too. Would love to include this map in a presentation I'm doing on aerial mapping if you don't mind! ?do you have the list of people who helped map? Would like to credit your work!